It is 11:30 p.m. and I am suffering from an incredibly intense chocolate craving that will not leave me in spite of prayer, distraction activities and half a loaf of bread and butter. Got out of bed and searched the flat. No luck. Not even a bourbon biscuit. Not even a cream egg left from Easter. All the shops are closed so no nipping out to replenish supplies. Nothing else for it. I’m reduced to the chocoholic’s equivalent of meths-cooking chocolate. It’s been one of those days for Theodora. Her mother has become the Greek equivalent of Delia Smith, her boyfriend would rather watch 22 men kick a ball around a field than go shopping with her, and chintzy Charity Hubble wants to pray for her. And of course, the crowning insult is her utter lack of chocolate. Join in her daily life with all of its challenges and joys, tears and laughter. The hilarious, sparkling and endearing diaries of a thirtysomething Christian, Theodora Llewellyn. This is truly a five-star winner. Witty writing without being overly sarcastic, clever characterization that keeps each person rich and intriguing in the reader’s mind. Theodora is refreshingly realistic. She is not smart, beautiful or even particularly spiritual at the start of the book, but she is likeable and her adventures are fun to follow. She is a colorful personality, and the people surrounding her are equally interesting–her Greek-obsessed mother, football-crazed plumber boyfriend, the Aussie Reverend “Digger” Graves, and maternal Pollyanna Mrs. Hubble. Each of them makes the plot vibrant and fast-paced. They are all consistent, and any emotional and spiritual changes are both believable and satisfying. The pun-ny writing is laugh-out-loud (or groan-out-loud) funny, reflecting dry British humor. I loved the way the prose rambled along, interspersed with moments of cheekiness that almost took me by surprise. I loved the lack of jaded sophistication, the absence of the kind of biting sarcasm that seems to always be putting someone down. This book makes me want to have a British accent. 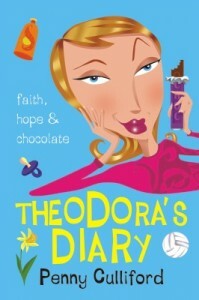 Laughter is the best medicine and “Theodora’s Diary” proves to be the tonic for whatever ails you. I came across this gem of a book two weeks ago after having a frustrating day in “stay at home wife/mommyland”. It saved my sanity! The book is written in the style of “Bridget Jones Diary” with a Christian theme. You will laugh till your sides hurt or until your neighbors will think you have “gone ’round the bend” as you read about Theodora’s life. The characters are memorable, the comic timing is perfect and the message is relevant for today’s women. Grab a chocolate bar, curl up in your armchair and enjoy the laughter! I’ve actually done it! I’ve kept up my diary for over a year. I may not have grown very much spiritually, nor have I been hailed as the next British supermodel, but I have gained a fiancé, even if he is football mad. And to cap it all, I weigh half a stone less than I did this time last year. Welcome back to Theodora’s world. Now a bit older but not much wiser, thirty-something Theodora Llewellyn begins her second year as a diarist. And as usual, the results are endearing, hilarious and delightfully human. Joy, bliss, ecstasy! Have just tried my holiday clothes on and they are actually too big! What a fabulous excuse to go and buy some new ones. Unfortunately, bank account doesn’t agree. Saving to get married is such a nuisance. In her search for life, love and a plentiful supply of chocolate, Theodora discovers that the course of true love never runs smoothly, especially when a voice from the past precipitates a crisis. But fear not – Theodora’s humour and wit are up to the challenge. In the end, just one question remains unanswered: Exactly how much vitamin C is there in a chocolate orange? Once again we look into the hilarious life of Theodora Llewellyn from the pages of her diary. We are reunited with family and friends and meet new faces along the way too. The novel is full of British wit and humor in the format of “Bridget Jones Diary” but with a Christian flavor.It has been said that “laughter is the best medicine” and that can certainly be said of Theodora’s Wedding. Grab your chocolate bar, curl up in your favorite armchair and enjoy! “I’m not sure I’m cut out for parenthood. Newlywed Theodora discovers a slight oversight she and Kevin made on their honeymoon. Now she’s gained an important new subject for her famous diary—but at such a cost! What? Theodora sick (literally) of chocolate? How will she survive without her favorite food group? Answer: with typical irrepressible humour that finds much to laugh at about marital bliss, faith, friendships, and the foibles of pregnancy. But will she be reunited with her lost love? Never fear—Theodora and chocolate can’t be separated forever. There’s a surprise bun in Theodora’s oven. 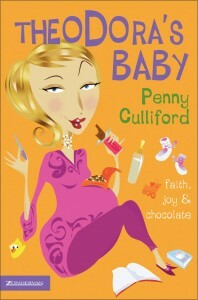 Theodora’s Baby is the third book in the series by Penny Culliford, with Theodora’s Wedding and Theodora’s Diary being the earlier two. Theodora loves writing in her diary, but her husband Kevin isn’t so fond of being replaced by a book with blank pages. He doesn’t understand why she can’t spell out her thoughts and concerns to him. This doesn’t stop Theodora’s journaling, though. Whether she’s faking a bowel problem or simply lying through her teeth, she just keeps writing and readers won’t want to stop reading. Readers can’t help but feel like an important part of this vibrant woman’s life, being able to read the secret diary not even her husband is allowed to touch. She’s a convincing character, brutally honest, and three-dimensional. The dialogue is snappy and true to life. Each character Theodora comes across is memorable. Expect to meet loveable, fun people as Culliford finds witty ways of introducing the characters into her story. The author portrays married life the way only an experienced individual can, with high energy and genuine humor. In the third book of the series, Theodora continues her diary. And her husband Kevin doesn’t want her to document their lives. But how is the newlywed wife to give up the tradition of recording her thoughts, feelings and hilarious opinions on paper? He tore out the description of their Greek honeymoon, but the outcome of their time in paradise is about to fill the pages. Theodora and Kevin are expecting a honeymoon baby! Theodora, who isn’t drawn to babies, feels ill-equipped to be a mother. She is also unprepared for how her single friends change their interaction with her, or how some members of the congregation at St. Norbert’s church respond. And, her life’s altered timeline interferes with her desire to engage in a ministry. Her commentary as she moves from shock to acceptance to excitement will delight female readers who have been there, done that. Never having been a parent I couldn’t relate to Theodora’s maternity woes. But I have been around enough pregnant relatives to appreciate her sense of humor about the inevitable changes in body and lifestyle. Oh, the horror of chocolate-induced nausea! Do friendships really have to change so much once a little one is on the way? Set in England, occasional terms like wellies, spuds and bangers, joggers, and jumpers had me searching the context to determine what the author meant. But, all in all, the book is great sport dishing up chick lit attitude from across the pond. 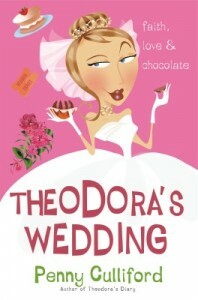 Quirky, irrepressible Theodora comes to terms with God’s plan for this baby and reunites with chocolate. I have read the first two Theodora books and loved them but think this one is the best yet. I couldn’t put it down and read it in a weekend. I hope hope hope that there will be another book after this one. And another and another and another. What a fantastic book!!!! “Theodora’s Baby” is the third book in a generally light-hearted and funny series revolving around the life and adventures of Theodora, a young Christian woman residing in England. When I first started out, the language differences threw me for a minute, before I realized the setting of the story was other than the United States. The story is written in diary form and spans the first year of Theodora’s married life. This particular novel in the series starts out with the return of Theodora and her husband, Kevin, from their honeymoon. Theodora expresses how her husband irrationally feels threatened by her diary and shows his disdain for her continuing to write in it. However, they come to an agreement and the story moves on to her new position as a sahw, not counting her one-day a week job as the secretary of her church, her family and friends, and her new “condition,” acquired during the honeymoon. While “Theodora’s Baby” can be read by itself, if “Theodora’s Diary” and “Theodora’s Wedding” are written as entertainingly, they would be worth worth getting your hands on as well. Nothing much ever happens in Monksford. Even so, reporter Jemma Durham dreams of the story that will take her from the small Monksford Gazette to a national newspaper. Then the town revives the tradition of the medieval mystery plays that were performed across England hundreds of years ago-and life in Monksford turns decidedly more interesting. Jemma takes a role to cover the experience for the paper. But the real story unfolds behind the scenes-a forbidden kiss, bribery, and tragedy! Jemma holds the power to destroy lives and advance her career, but at what cost? A really engrossing story with unexpected plot twists, credible characters set against the background of the Mystery plays. Profound and funny, I loved this book and it held my intrest on every page. Read it. I really enjoyed this book. Penny is such gifted, talented and witty writer. She has an expert knowledge on the Mystery plays and I thought her characters were true to life. A really engaging and enjoyable read. I was so sorry to put it down!! I picked this up as a light read, and while it definitely isn’t heavy, it wasn’t as fluffy as I expected. It was a wonderful page-turner with great characters that, while they take a bit to develop and relate to, you really root for in the end. I really hope to find another book to see what happens to these people. 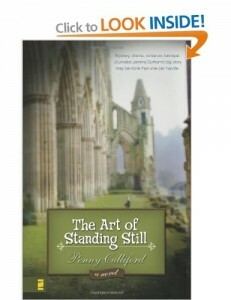 There is a great sort of twist that makes this book stand out as different from other books of this genre. I really enjoyed this book a great deal and definitely would recommend it if you are looking for a book that isn’t too heavy, but isn’t just about being boy crazy.